It was probably a good thing this one got away. A great white shark approached a fishing charter boat in Cape Cod Bay Thursday morning, jumped out of the water, and took a bite out of a striped bass that was being hauled aboard, the boat’s captain said. Captain Steve Peters, the owner of Orleans-based Triton Sportfishing, took a video showing the fearsome predator swimming around the 38-foot vessel after it stole the fish. The shark was only around for about 25 seconds, Peters said, but it was enough time for the people aboard the boat to have the experience of a lifetime. The sharks are sharing the warming waters with seals, fish — and holidaymaking humans. The shark, which Peters estimated was 12 feet long, swam up as a deckhand was reeling in the bass around 8 a.m. The shark “came out of nowhere” and chomped on it, leaving nothing but the bass’s head, he said. Despite the proximity of the shark to the boat, there was never any danger to anyone. The shark wanted the bass and most likely “couldn’t care less” about the boat itself, he said. State shark expert Greg Skomal reviewed the video and confirmed it was a great white. The incident happened about 2 miles offshore. It was the third shark Peters has seen in Cape Cod Bay this summer, he said, and that was about the same rate that he saw them last summer. In 40 years on the water, he said, he’s only seen sharks in the bay in the past three or so years. 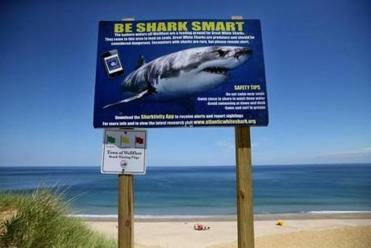 In the past week alone, there have been 16 shark sightings around Cape Cod, including this one, according to the shark-tracking application Sharktivity.